Reality Central is a nonfiction anthology featuring short, high interest, readings on topics and issues students encounter every day. Selections are written slightly below grade level to reach all readers, making the program ideal for English Learners and striving readers. The passages in Reality Central align with the topics, skills, and Big Question in Prentice Hall Literature ©2010, and is flexible enough to be used as a stand-alone program. 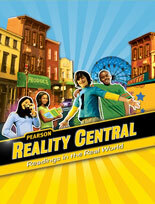 Use Reality Central for a class starter, homework, or independent activities for those needing extra reading practice. The accompanying Writing Journal gives students complete writing support, guided practice, and extensive vocabulary support, including graphic organizers. The Teaching Guide includes correlations to Prentice Hall Literature and complete support for every topic and theme.